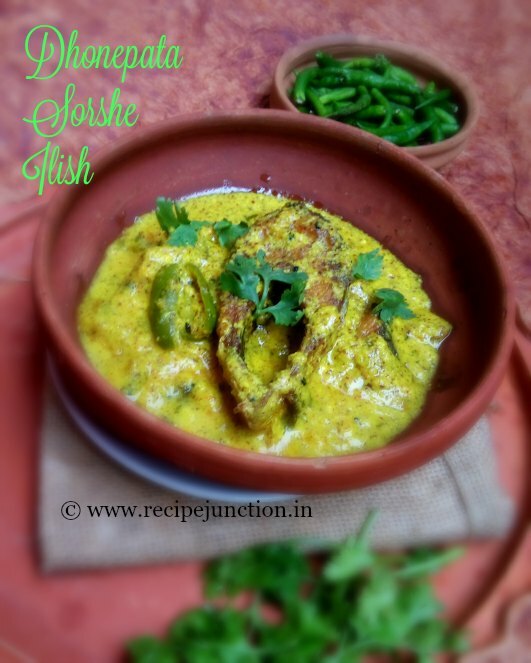 I think this monsoon season I havn't posted one single Hilsa Fish recipe yet. If you're wondering why I'm associating Hilsa fish with monsoon, then I must tell you that In India, The safest period of eating Hilsa fish starts with the onset of Monsoon till the beginning of Autumn, i.e., around early October. 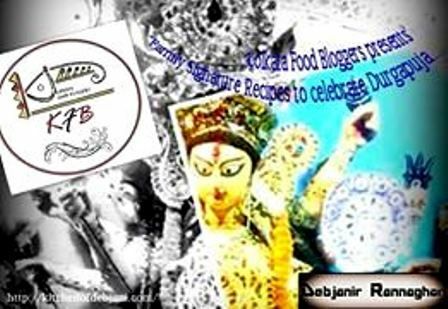 During Durga Puja, Bengalis love to devour some Hilsa fish. Then again around February we can eat the fish again. 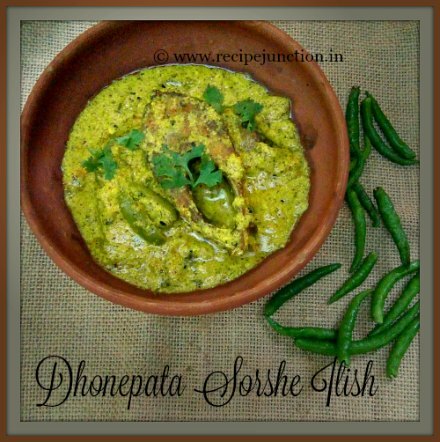 Durga Puja is just around the corner, so thought to post something special I have experimented with this fish and it came out quite tasty and my family liked it a lot. 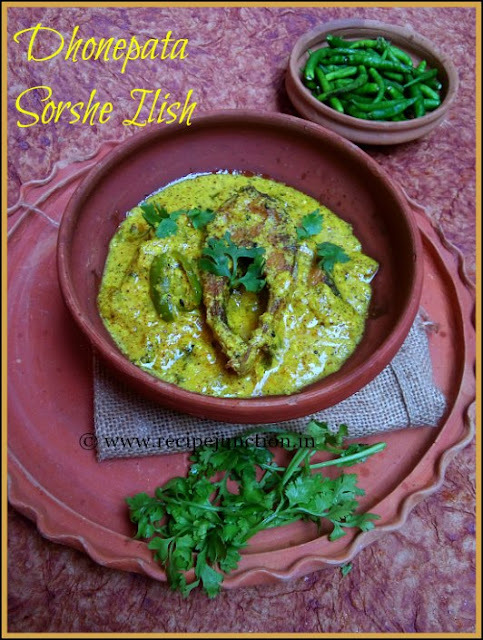 This is not a traditional recipe of making Sorshe Ilish but just a variation. I have tried adding coriander paste to the recipe as I tried with other fish like this as I love the flavour of coriander leaves with fish and even I tried with chicken too. But never did I try to experiment on Hilsa Fish. But one day, the experiment genie inside me pushed me hard to give it a try and I did finally this monsoon and with very steady hands and an open mind I did the cooking and it was so tasty and from then it has become staple in my home. Black Cumin seeds/kala jeera/Kalonji : 1/2 tsp. Black Mustard seeds : 1 tblsp.+ yellow mustard seeds : 1 tblsp. Preperation : 1. Marinate the fish pieces with 1/2 tsp. turmeric and 1/2 tsp. salt. 2. Soak both the mustard seeds for 1/2 an hour in little water. Then wet grind mustard seeds with 2-3 green chillies or as much you can tolerate and coriander leaves with a pinch of salt and few teaspoons of water. Add water to make a smooth paste. When the paste is ready, take it in a bowl and add ginger paste, 1/2 tsp. turmeric powder to the mix and mix well. Cooking : Heat oil, preferably mustard oil for frying the fish. Add the fish pieces in oil and in medium heat fry the fish till they have just changed the color on both sides. Take out and keep aside. Heat little more oil in the same pan, add kalajeera/kalonji/black cumin seeds, when the seeds start to splutter, lower the flame, add the mustard-coriander paste to the oil. Add a pinch of sugar. Mix and let it cook in medium flame, when oil starts to separate, add the fish pieces and slowly cover them with the paste. Now add about 1/2 cup of warm water and add it to the pan. Season with salt and cook until gravy thickens a bit. Remove from heat and garnish with some more of chopped coriander leaves. Bengalis love this fish preparations with warm plain rice.